Beach Data was established in 1992 as a cooperative of five NYSE investment banking firms to provide wholesale data services to its members. It incorporated in 1994 and has provided services to over 95 dealer banks and brokerage firms over the years. It is not owned or affiliated with any brokerage firm or bank. The company opened its original office on St. Pete Beach, Florida. The Bond Data Base division and its BD Research division are headquartered in Florida (closed in 2016). The Income Tax Preparation and Business Services are based in TYBEE ISLAND, Georgia. It serves the Tybee Island, Wilmington Island and Whitemarsh areas. The employees of Beach Data have over 70 years of combined Accounting, Business Management and Income Tax Preparation experience. We have two licensed tax preparer's led by a degreed accountant on staff. WHY ARE WE CALLED BEACH DATA? There are two schools of thought on that issue: One is because our first office location was in downtown St. Pete Beach, Florida. The other is because the bulk of the founders of the company were employed at a NYSE brokerage firm that closed its Florida office. There is an expression in that business that says when you are unemployed you are "on the beach". Either way, the name fits. WHY BUSINESS SERVICES AND TAXES? The principles of the firm discovered, while doing tax preparation as a side job, that there are a lot of business's that don't have the time or patience to keep up with all the changing rules and regulations involved with payroll, accounting, bookkeeping and taxes. They also noticed that in this economy, it was getting very costly for businesses and their employees to file their taxes. Our goal is to provide professional, competitive and confidential services to residents and businesses in the area. WHY TYBEE ISLAND? The principles of Beach Data purchased property on the island over ten years ago and built a small house. This "home away from home" has proven to be a very hard place to leave. And, after all, Tybee does have a beach. 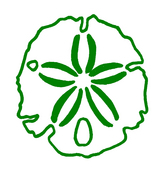 WHY A SAND DOLLAR LOGO? There are more sand dollars on the beach then there are bottles with money in them. Besides, all the cool, beach logos were taken. WHERE IS OUR TYBEE OFFICE? We are located at: 3 Taylor St, Tybee Island.